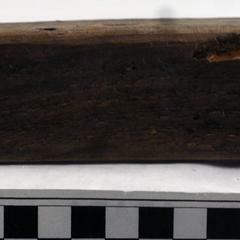 Long, thick wooden piece notched at one end. Squared wooden piece that is carved flatter on one end and with a 4.5 cm notch on the same end. Condition: Fair. Surface is slightly "hairy" from wood beginning to pull apart.